Thelma Petrey, age 93, of November 24, 2018 at the Hazard Health and Rehab in Hazard, KY. Thelma worked along side her husband at Petrey Studios. 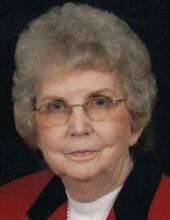 She was the daughter of the late Talton Napier and the late Sallie Ann Smith Napier. She is also preceded in death by her husband: Sanders Winchester Petrey and three brothers: Arthur, Arnold & Pascal Napier. She is survived by two daughters: Carole Yonts (Jerry) of Hazard, KY & Dr. Katherine Duncan (Keith) of Georgetown, KY; four grandchildren: John Bartlett (Nicole), David Yonts (Tracy), Daniel Yonts & Mike Bartlett (Shea); three great grandchildren: Sanders, Silas & Sofia Bartlett along with a host of family & friends. To send flowers or a remembrance gift to the family of Thelma Petrey, please visit our Tribute Store. "Email Address" would like to share the life celebration of Thelma Petrey. Click on the "link" to go to share a favorite memory or leave a condolence message for the family.